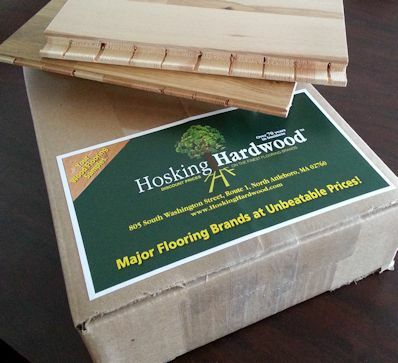 Ordering $1000′s worth of hardwood or laminate flooring online can seem a bit daunting at first. Add to that the concept of seeing a tiny square picture of a floor and basing your purchase off that, and you’re upping your potential for disaster. It’s difficult, too, to get the true coloring of a hardwood or laminate product by simply looking at a website. Brands try to get their colors online true to the product, but different monitors can show different tones and shades. As my perception of color could be a bit different than her own, I really couldn’t give her a solid answer on this. I could offer my opinion, but not the concrete affirmation of color tone she was looking for. Ultimately, the solution for her was to order a sample. Something she could hold in her hand and see just how red it was. Hardwood & Laminate samples for color match. There is a caveat though, especially when it comes to real hardwood flooring: it’s important to keep in mind that wood is a natural product and a single sample might not be an absolute representation of the hardwood floor as a whole. Within the cartons of the color you choose could be slight variations from board to board and/or different grain patterns than that of the sample you saw. Usually homeowners interested in real wood floors understand and appreciate that hardwood flooring is a product of nature and that no two boards can be guaranteed to be exactly alike. How do you get a sample of a hardwood floor? Customers at Hosking Hardwood Flooring can order samples of many of the hardwood flooring products we showcase on our website. However, with over 50,000 SKU #’s, it’s difficult to have a sample of every single floor on our website available in our warehouse. If you’re interested in a product on our site which does not seem to have a sample that we carry, there are a few different ways you can go about seeing the specific floor in person. Firstly, pretty much any respectable brand of hardwood flooring or laminate flooring is going to have their own website. The site could be very involved or a bit on the simplistic side, but they usually have some sort of online presence. The more involved flooring brands sometimes actually allow customers to order samples directly from their website. Examples: QuickStep is known for their up-to-date and informative website (http://www.quick-step.com/); and they also offer laminate samples to ship direct to you, for a small fee. Anderson Floors offers up to 4 samples of their hardwood flooring products to ship to you for free via their website (http://andersonfloors.com/). Of course, it would be great if all hardwood and laminate manufacturers offered this sample service direct from their website, but it’s just not feasible for some brands. An alternative to getting samples shipped to you, is finding a way to get to where the brand’s samples are. It depends on the magnitude of the particular flooring brand, but most hardwood and laminate flooring displays can be found in a showroom local to you. To find the closest showroom for a particular brand, visit the brand’s website and use their “Dealer Locator” to search. Sometimes a larger showroom display board is more beneficial than a small color swatch sample, as there is typically more than one board shown and you can see some of the more common variation that may occur in that specific floor. Seeing more than one board is especially important in rustic grade products and exotics like Brazilian Cherry or Santos Mahogany (as, with specific exotic species, there can be a ton of color variation from board to board). While we obviously don’t recommend it with the display boards in a local showroom, if you are able to procure a sample of the hardwood or laminate floor you’re interested in, you can beat it up. Drag a chair over it. Drop your keys on it. Seeing how the hardwood or laminate react to certain everyday traumas can be really helpful in determining if that really soft American Cherry can stand up to your busy foyer or if you’ll have to go with a harder Maple or Hickory. We’ve even had a customer get an engineered sample and stick it in water to see if the finish would delineate if there was an appliance leak. Perhaps, before you beat up your sample, take a minute to feel the surface texture. Is it smooth? Handscraped? Wirebrushed? Is it the texture that you want for your flooring? Holding a sample of hardwood or laminate flooring gives you a great opportunity to see the construction of the floor board before it’s put down. You can see how the floor is put together: check out the total thickness, the wear layer (if it’s an engineered), the number of plys (if it’s an engineered), the core (if it’s an HDF engineered or laminate). On a more aesthetic level, having a sample in your home allows you to compare it to the room decor colorwise. Nobody wants a new hardwood floor in their kitchen that’s going to clash with the new cabinets. The ultimate take away: seeing a physical sample of the hardwood or laminate floor you’re interested in is never a bad idea. In fact, it’s very much recommended — especially when considering ordering a floor online. The sample will give you a much better idea of the tone and richness in color of the hardwood or laminate floor than simply looking at a picture online. This entry was posted on Thursday, April 24th, 2014 at 12:24 pm	and is filed under Hardwood Flooring Manufacturers. You can follow any responses to this entry through the RSS 2.0 feed. You can leave a response, or trackback from your own site.